Boy did I wish I’d brought my jacket this day. It was a chilly morning, but thankfully, within hours the day warmed and the clouds cleared. 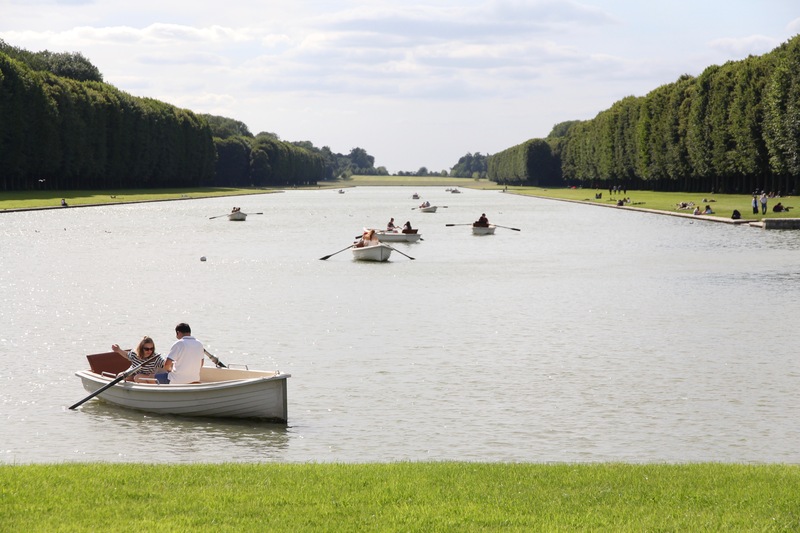 Versailles is another place to which you want to arrive early in the morning. We caught the C-Train, which was packed with both commuters and tourists, then walked to The Château. This. Was the line. 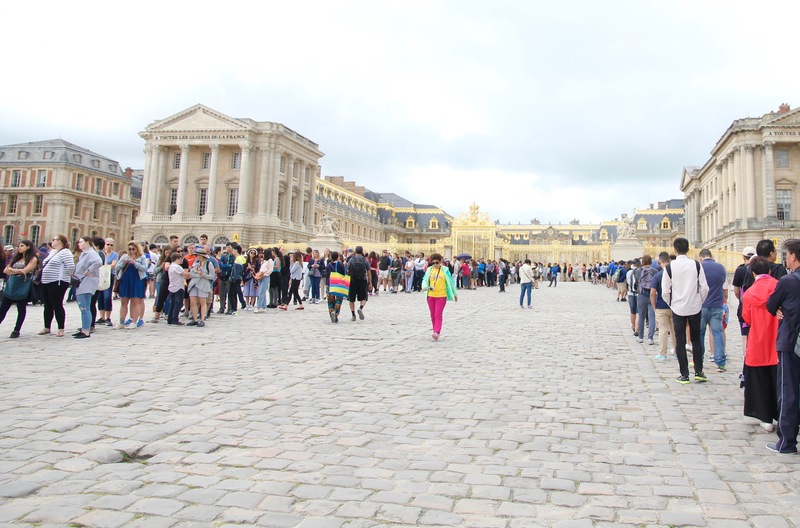 It wasn’t even 9AM and eager tourists were already snaking in crowded lines, back and forth across the road leading to the palace gates. But nothin’ gonna break her stride. Liza was all thumbs up that morning. 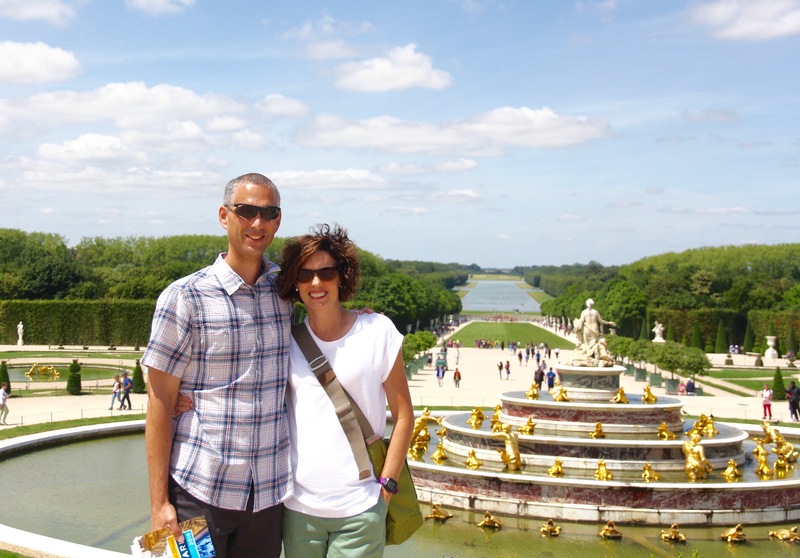 We had another 40 minutes or so until Versailles opened, so Doug and Eliza walked back into town to find a bakery and buy some pastries. I held our place in line. 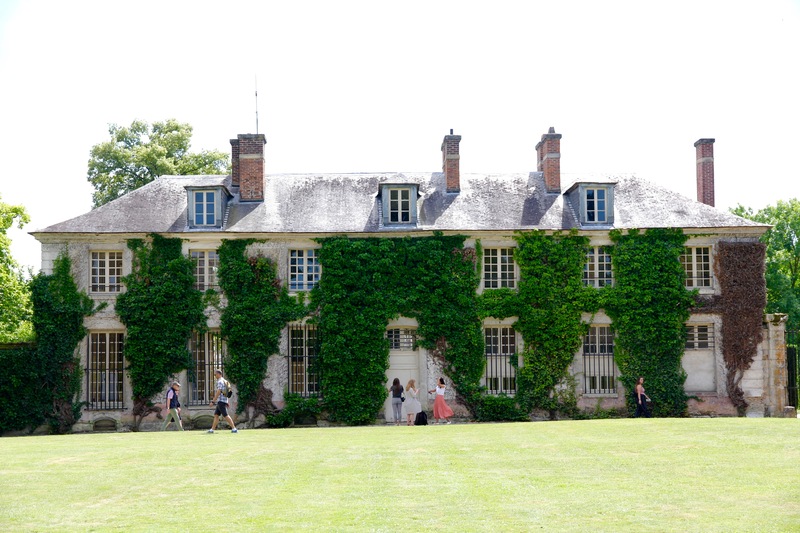 I stood shivering in place, shifting my weight left, then right, trying to stay warm as I read about the Château. 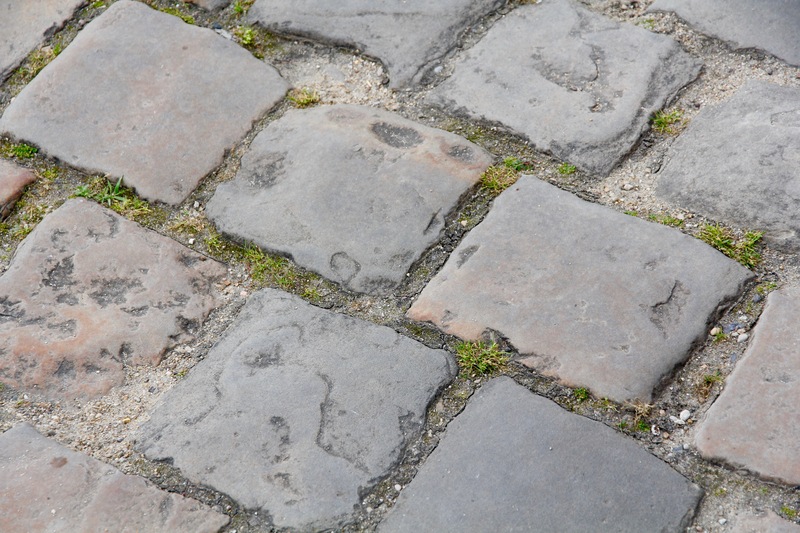 Look at this cobblestone drive. It’s been there for over 300 years. Imagine as many as 5,000 nobles arriving here on a given day, prancing out of horse-drawn carriages, rising out of chair-taxis, dressed in all their finery. 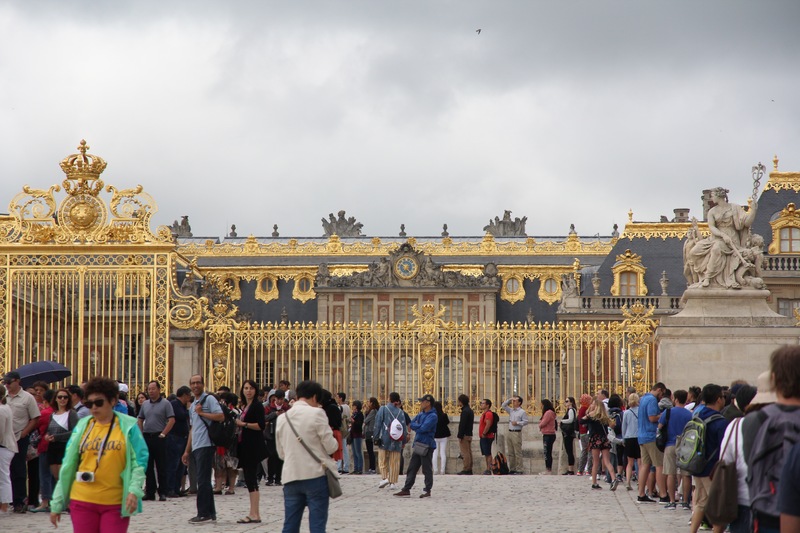 The palace, or château, was the residence for French monarchs for over 100 years — from the late 1600s until the Revolution in 1789. 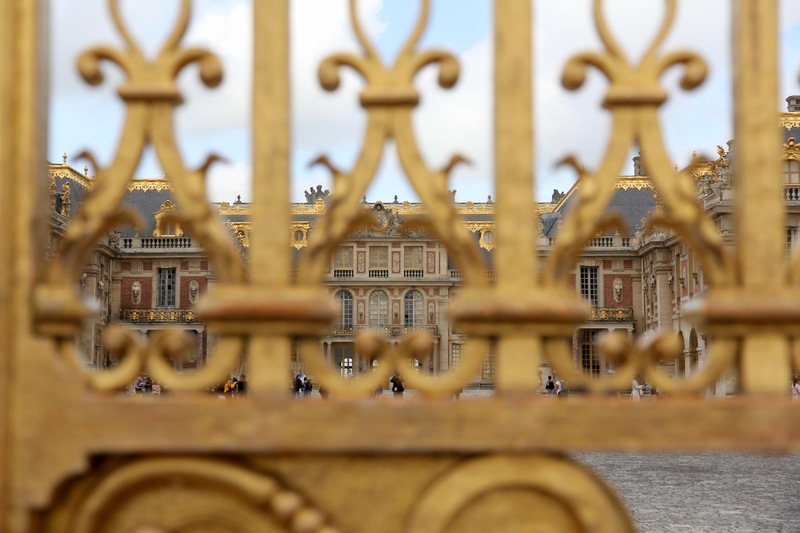 King Louis XIV left the Louvre in Paris (he’s pervious royal residence) to create Versailles, a place in the countryside, away from the politics of Paris. 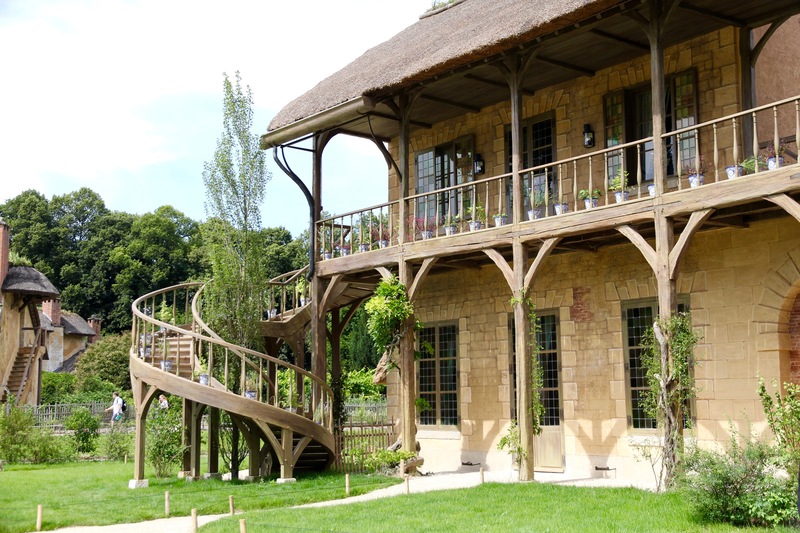 He used the public treasury to turn his father’s hunting lodge into a palace fit for the Gods. And he counted himself as such. A God. Notice the extravagant golden gates. I got a kick out of Louis XIV. He called himself the Sun King. Apollo. The perfect man. The perfect King. And he really thought he was the best thing since sliced bread. But maybe bread wasn’t sliced yet? Well, he thought he was the cat’s pajamas. The bees knees. The first room we viewed upon entering the chateau was his Royal Chapel. Every morning at 10AM, an organist and musicians struck up the music, big golden doors opened, and Louis’ family would step onto the balcony to attend Mass. 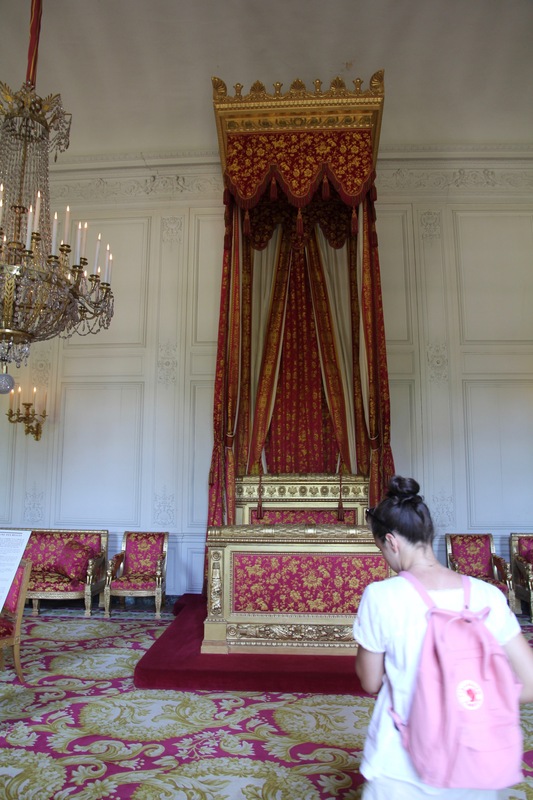 While Louis looked down at the golden altar, the lowly nobles on the ground floor looked up at Louis, worshipping him, while He worshipped God. 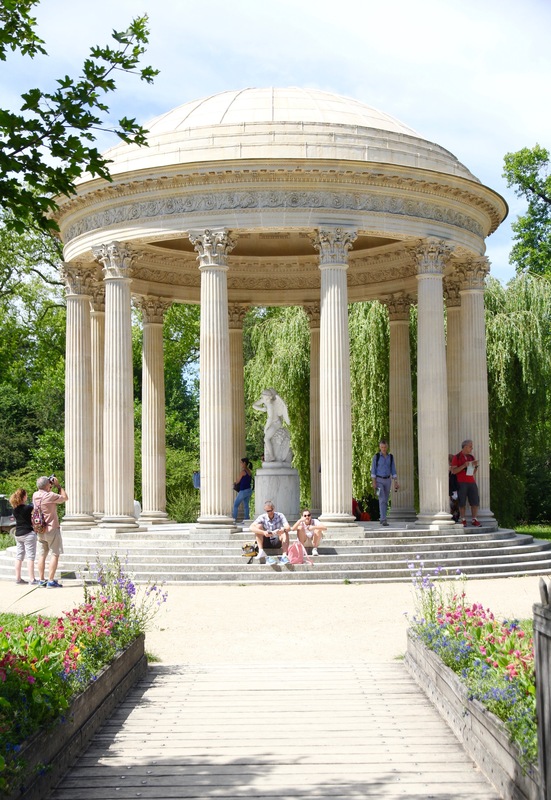 The irony of this pagan temple he called Versailles, is that it was built not to glorify God, but to glorify himself. And it is almost too much to handle. This was a time when you were born poor or you were born rich, and there would be no mobility. The rich flaunted what they had and ignored the poor. 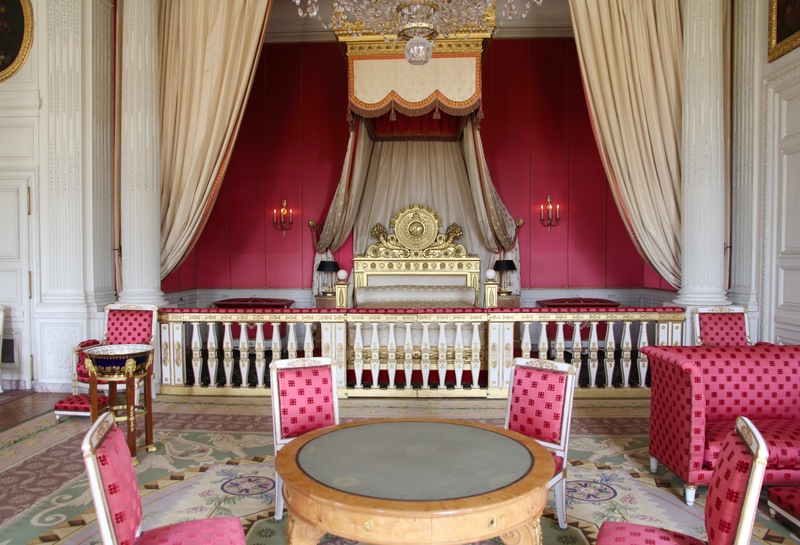 His private bedroom faced the rising sun – the palace grounds laid out on an east-west axis. 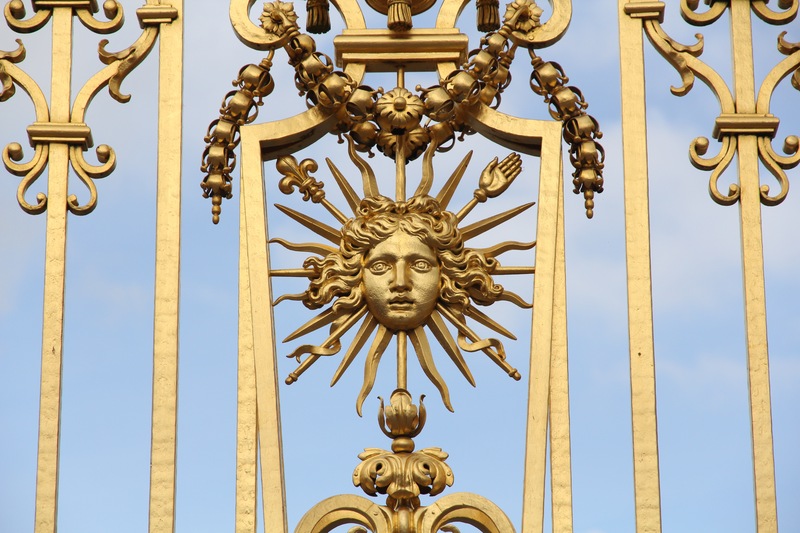 This Sun King insignia can be found all over Versailles. 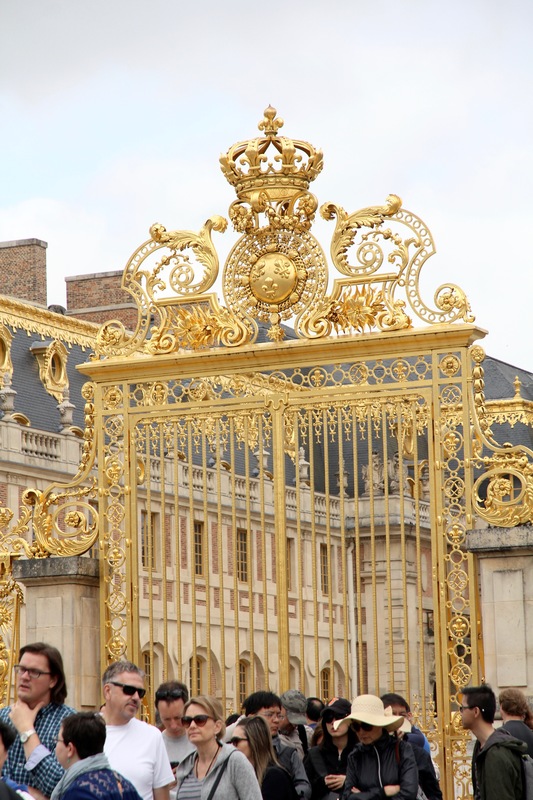 King Louis XV and King Louis XVI, the two Louies that followed the Sun King, spent most of their time gilding the already existing palace, adding more pomp and froof and frill. 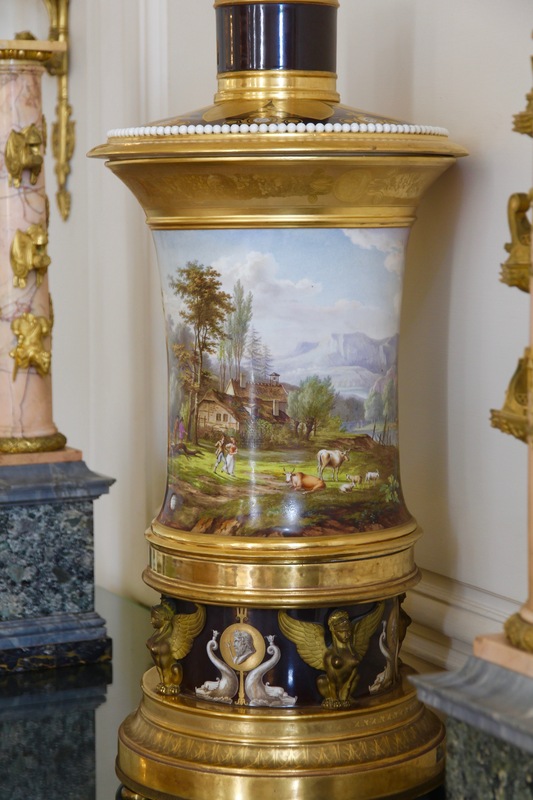 Louis XV was said to be the the most polite and approachable of the Louies. He carried on the same policies and traditions, but did it without the Sun King’s flair. During his reign, the French monarchy began to crumble. At the death of Louis XV, instead of getting a strong leader to reestablish the old feudal order, France got Louis XVI, a bookish boy who married a sweet girl from Austria, Marie Antoinette, and together they retreated into the idyllic gardens of Versailles while rumblings of a revolution brewed and smoldered just a few miles away. Then, of course, the revolution happened. Louis and Marie planned and executed a failed escape and eventually, they were beheaded. 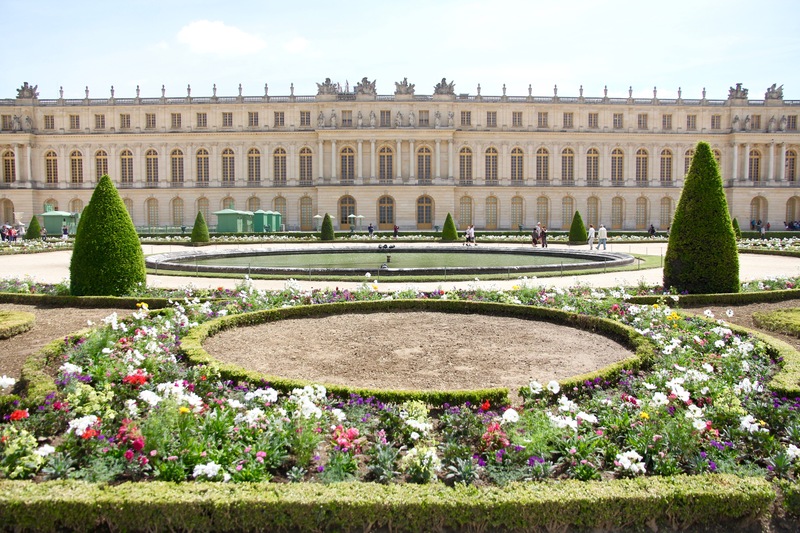 In 1837 King Louis-Phillipe (a constitutional monarch rather than a divine monarch) opened Versailles as a museum. 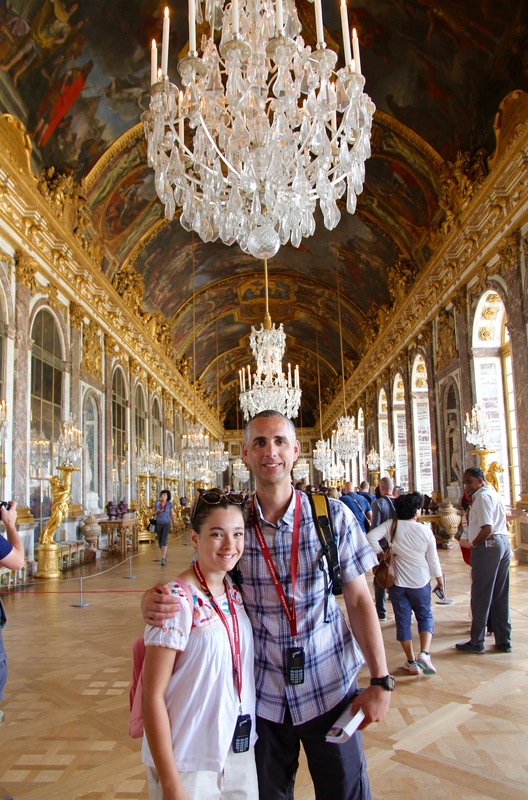 Here we are in the famous Hall of Mirrors. Wow. 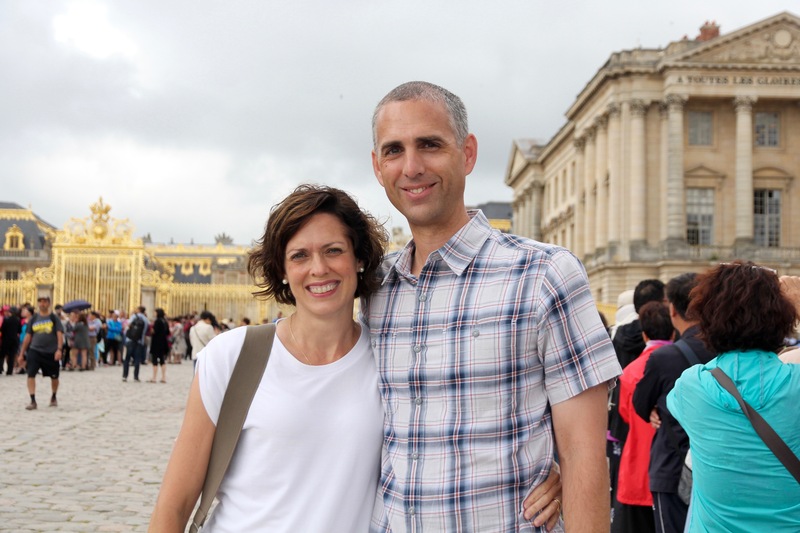 Pleasure ruled at Versailles. There were balls and receptions, party goers wearing beautiful silk, wigs, and lipstick, gluttonous foods and dancing to string quartets. No one had ever seen anything like this when it opened. Mirrors were still a great luxury at the time. The hall is nearly 250 feet long with 17 arched mirrors matched by 17 windows opposite that look out onto the Gardens. 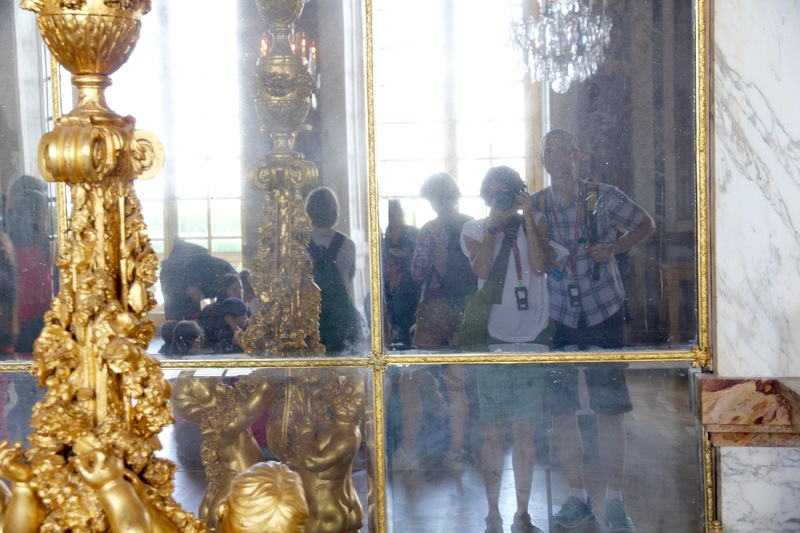 Lining the hallway are 24 gilded candelabra, busts of Roman emperors, and over two dozen chandeliers, all of which would have been lit by thousands of tiny flames. The room is complete with Louis himself painted into the central panel of the ceiling, cupids playing cards at his divine feet. Originally the carpets mirrored the art on the ceiling. I guess this was a time when beautiful people liked to look at themselves. Maybe a modern version of the hall of mirrors is right in the palm of our hand — available for selfie mode whenever we feel inclined. 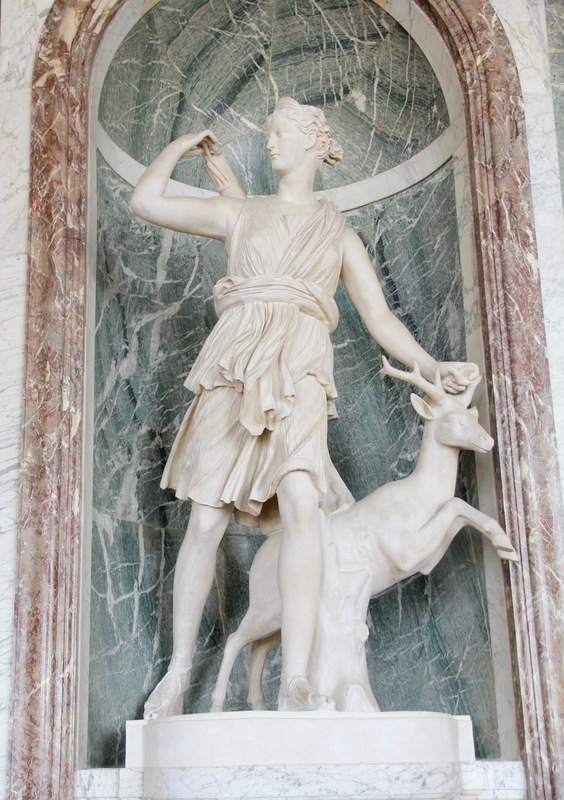 Liza continued to impress me with her knowledge of Roman mythology, naming each of the statues throughout the château. 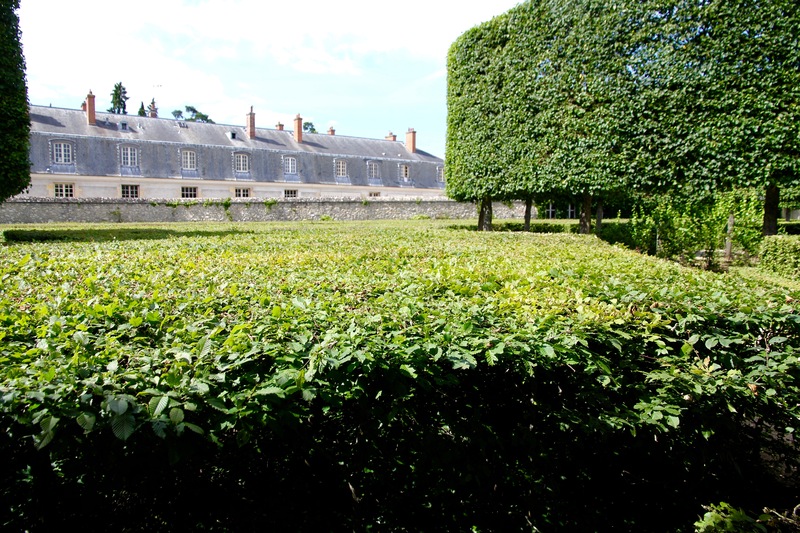 After touring the main palace, we made our way out to Le Jardins. 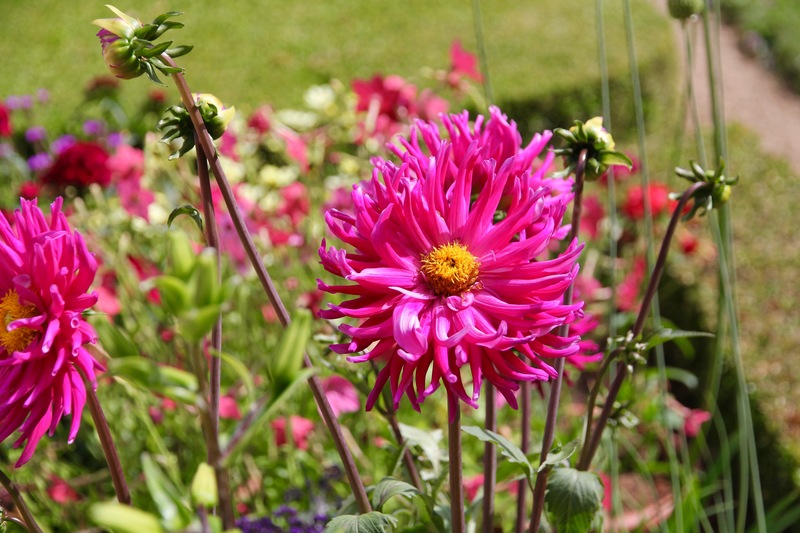 Gardeners were still planting all the summer flowers at this point. I would have loved to see this place come August. Behold the Royal Drive. 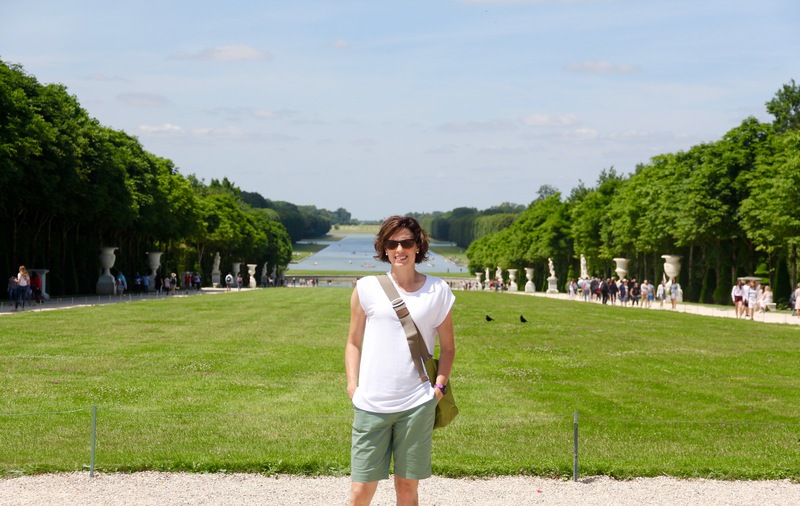 To me, this is the most stunning spot in Versailles. The grounds seem to go on forever. Trees every direction you glance. 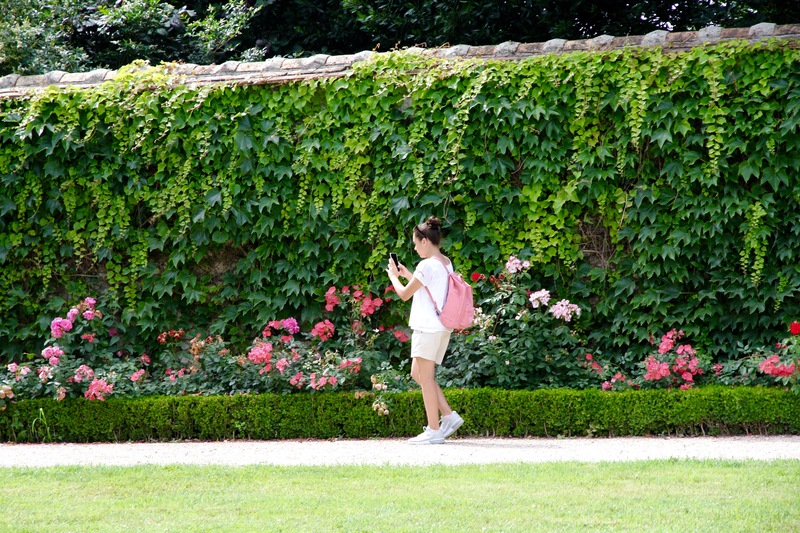 An 8-mile axis of paths to explore. 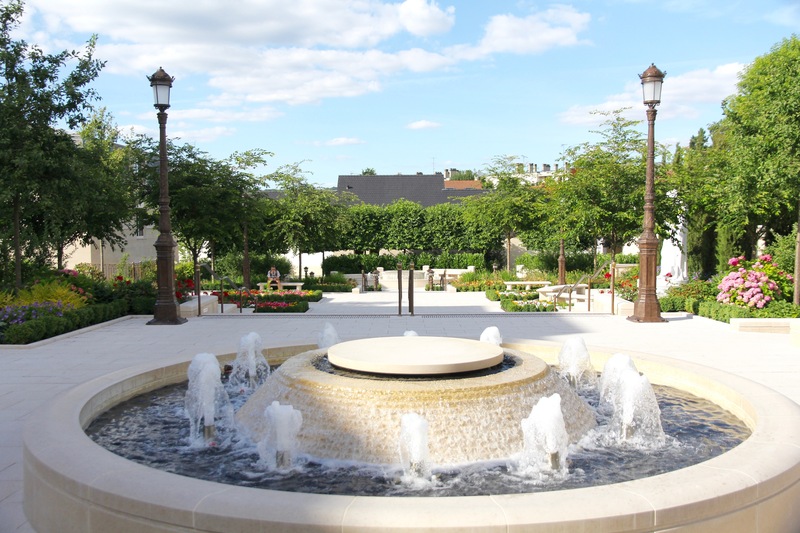 Fountains. Statues. 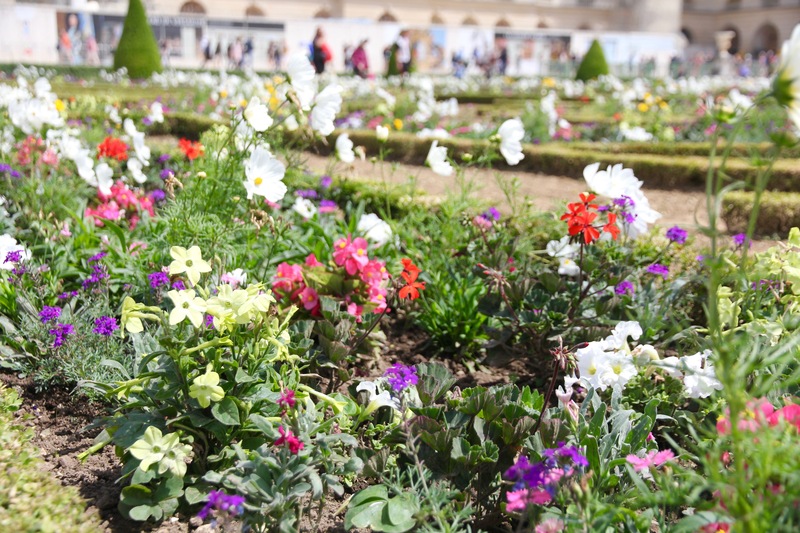 A flora wonderland. 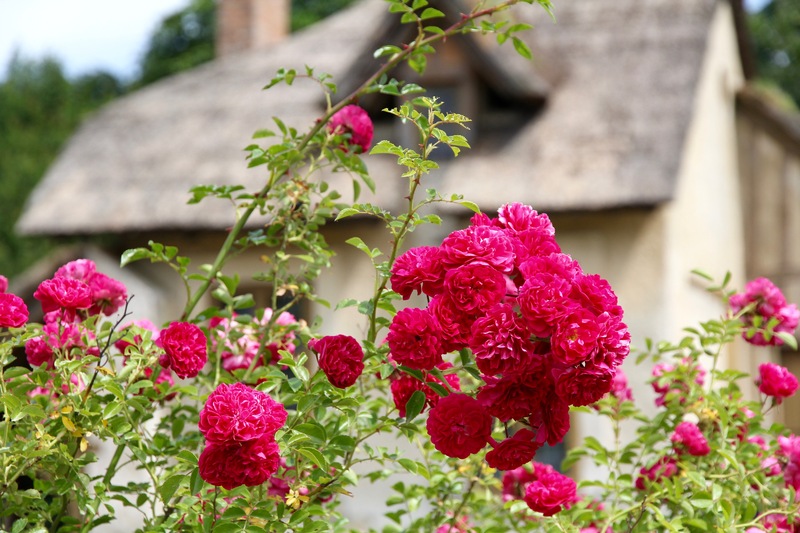 Everything in the garden is symbolic. 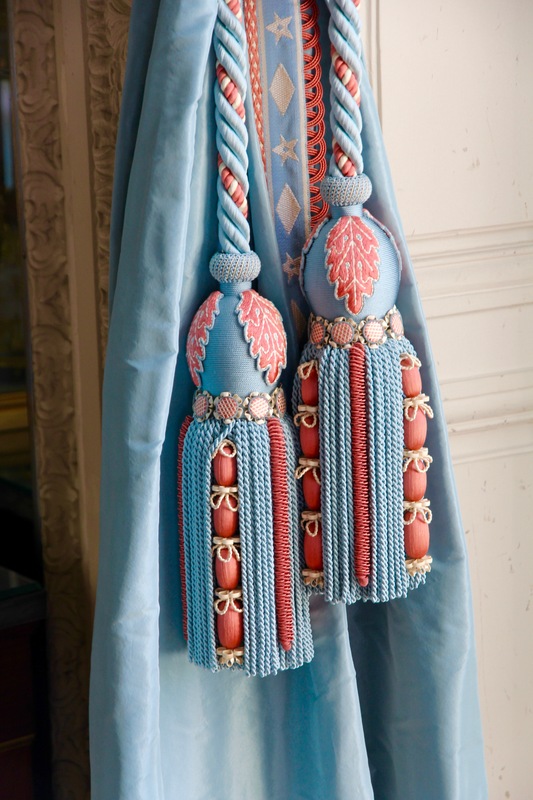 Much of it circling round the theme of Apollo, associated with Louis XIV. The Latona basin, pictured here, tells the story of the birth of Apollo and his sister, Diana. 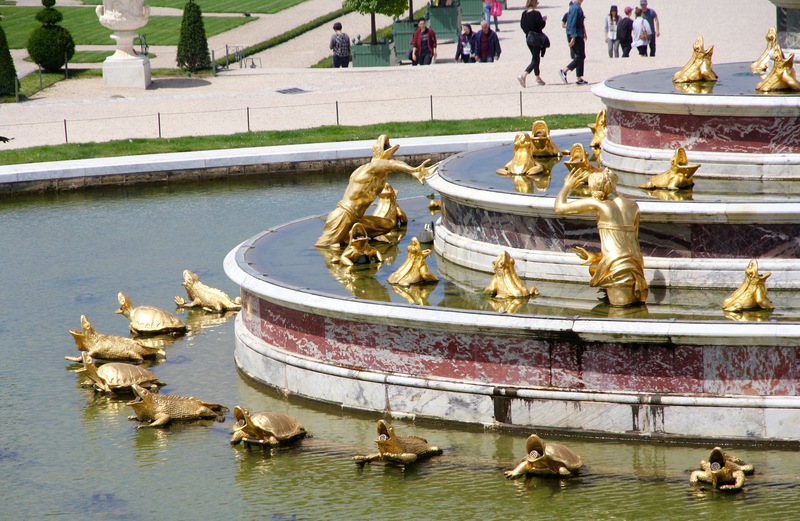 Atop the fountain you can see Apollo, with his sister Diana, clinging to the skirts of their mother, Latona. You may remember, the father of her children was Zeus and when she was insulted as being an unwed mother, she called on Zeus to avenge the insult and Zeus turned all the peasants into frogs and lizards. 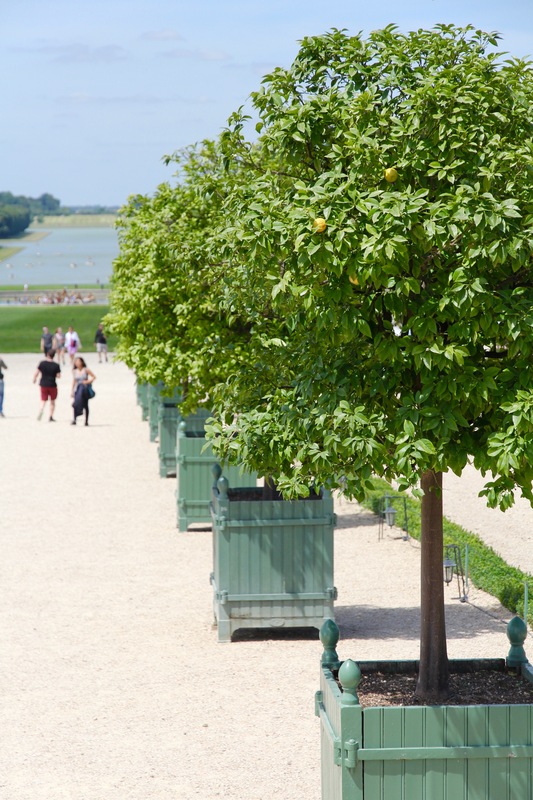 Louis had around 300 orange trees growing in a greenhouse beneath Versailles. 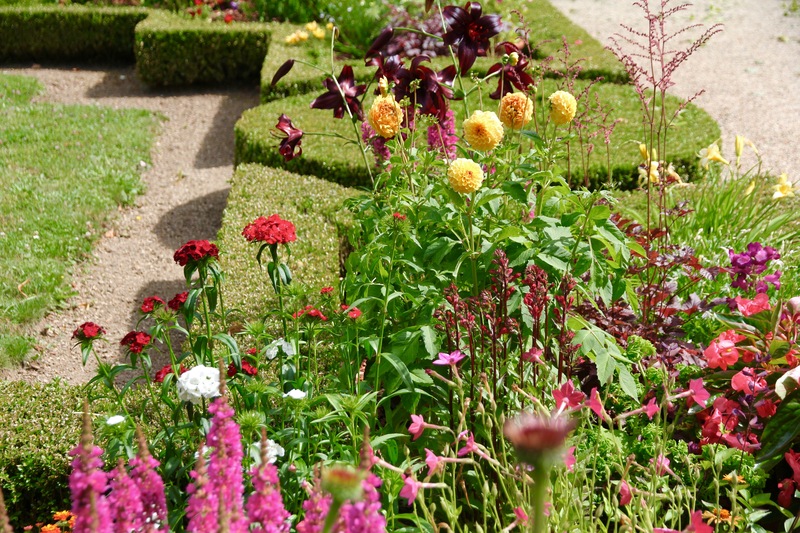 He had them brought out onto the grounds on warm days to prove he could make anything grow in Northern France. Can you believe it? I was surprised again and again at the extravagance. Rick Steve wrote, “Why visit Venice when you can build your own?” Couples in gondolas would pole along the water accompanied by barges with orchestras playing. Originally, authentic gondoliers imported their boats, and lived in a small settlement next to the canal. 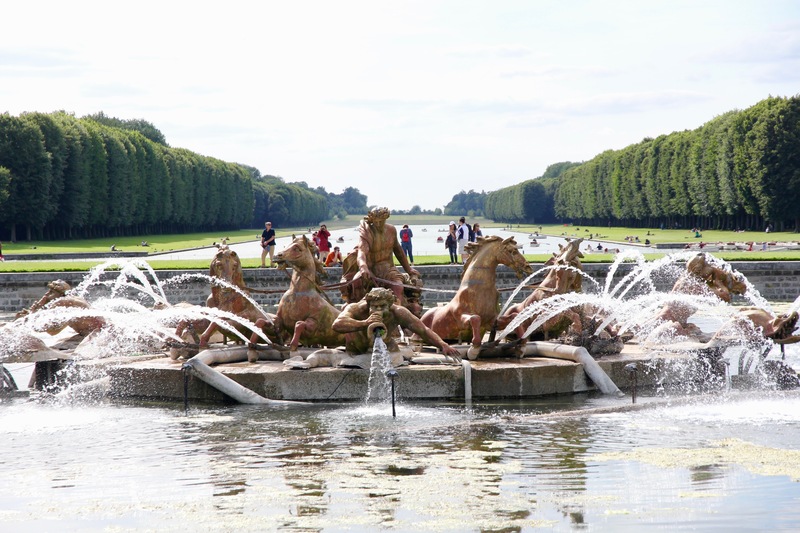 Here is the Apollo Fountain, with Apollo (crafted to look like Louis XIV) rising up out of the water in a four-horse chariot. His entourage includes dolphins and Tritons blowing conch shells. 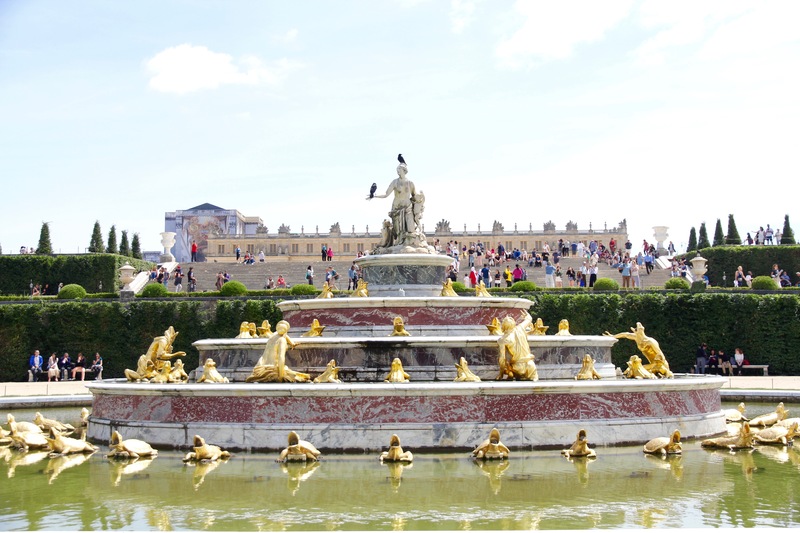 It was amazing to me that all the fountains in Versailles (and there were a lot) were gravity-powered. 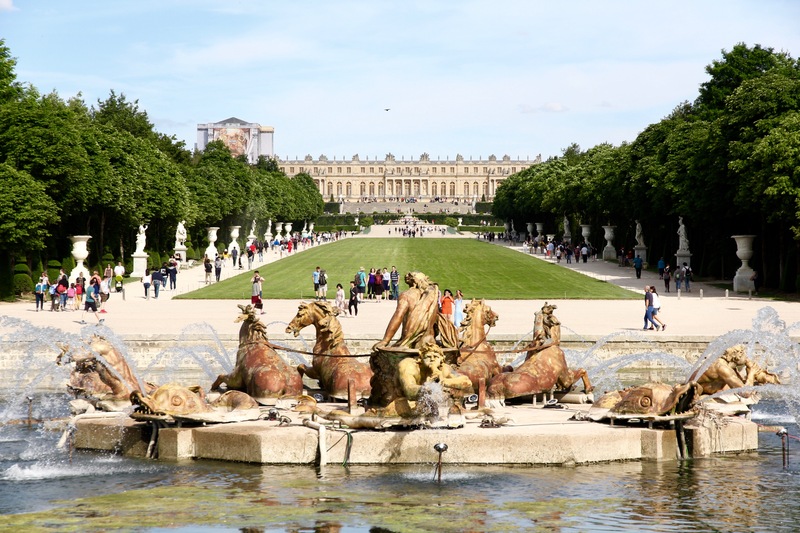 Underground streams, pumped into Versailles by Seine River pressure, fed into smaller pipes at the fountain, which shot the water high into the air. The fountains are still run on this gravity system. 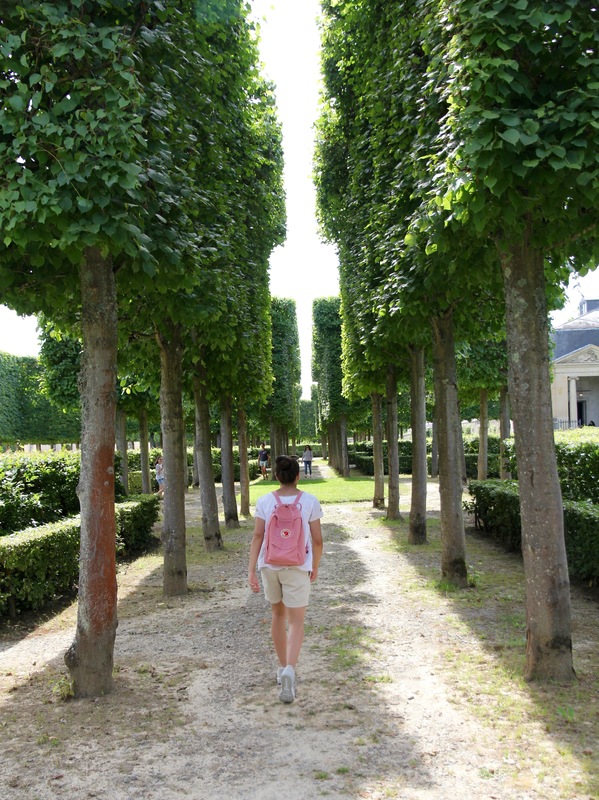 The trees were tall and straight, with lovely pathways to explore. We ate lunch by the Grand Canal, then left the Royal Drive to walk to Marie Antoinette’s Hamlet. It’s only a 10 minute walk and it’s a beautiful stroll. Above you can see Eliza and Doug sitting on the steps of the Temple of Love. Cupid, the center sculpture. 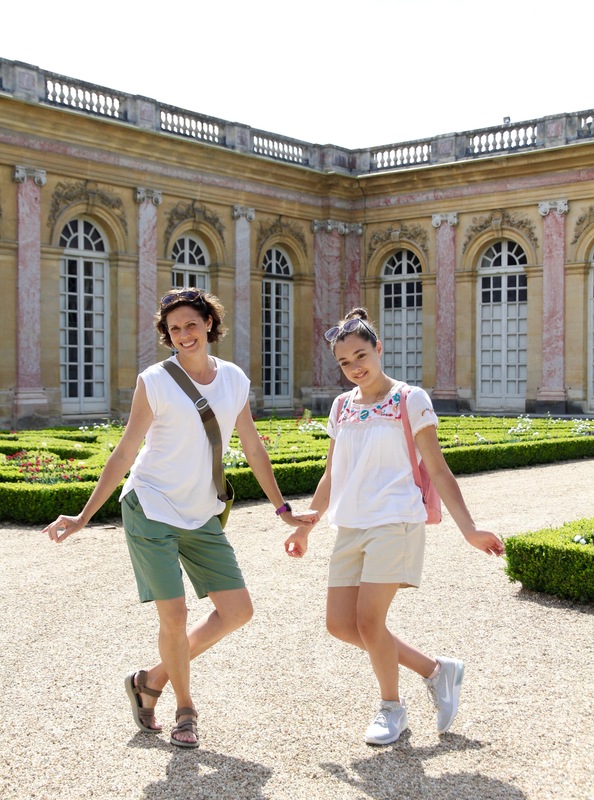 Marie’s Hamlet was my favorite part of Versailles. 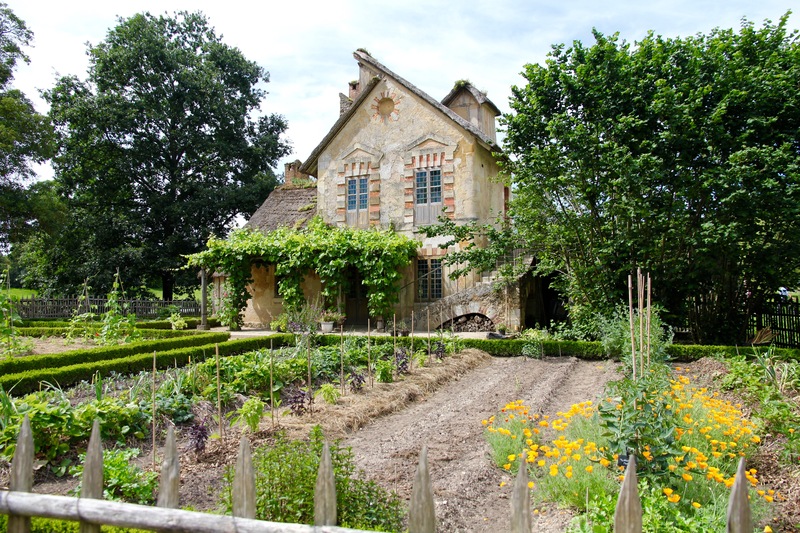 It was rather rustic, much less ornate, and more of a respite with simple but charming thatch-roofed homes, farm animals, and well-kept gardens. 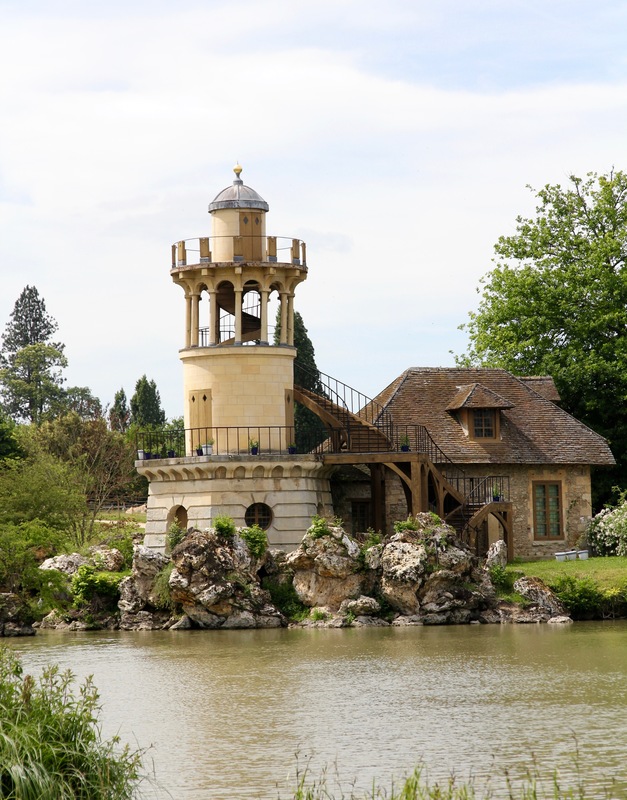 The light house tower (pictured above) fronted Marie’s man-made lake. 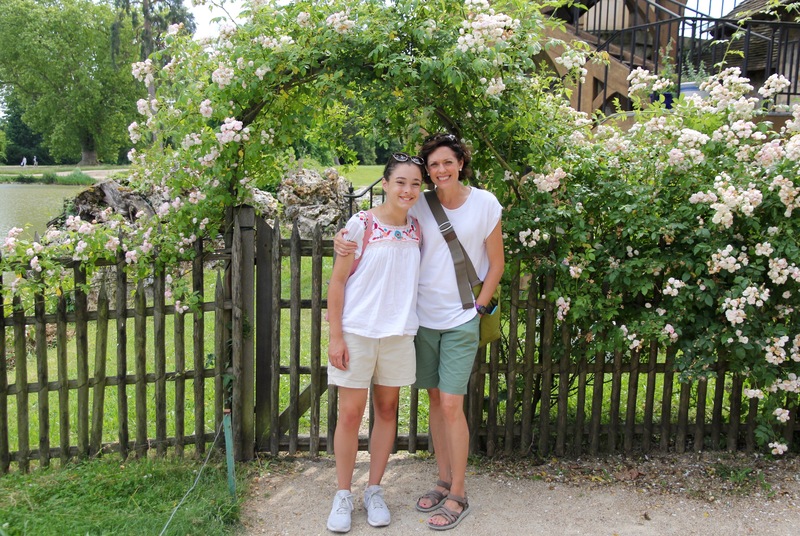 She longed for simple country pleasures, and while she wasn’t up for doing much of the work, she was happy to direct the hard labor of real peasants who worked her hamlet, ran an actual working dairy farm, handled the water mill, pigeon coop, and lots of domestic animals. She would “supervise” in a plain dress of white muslin and a straw hat. 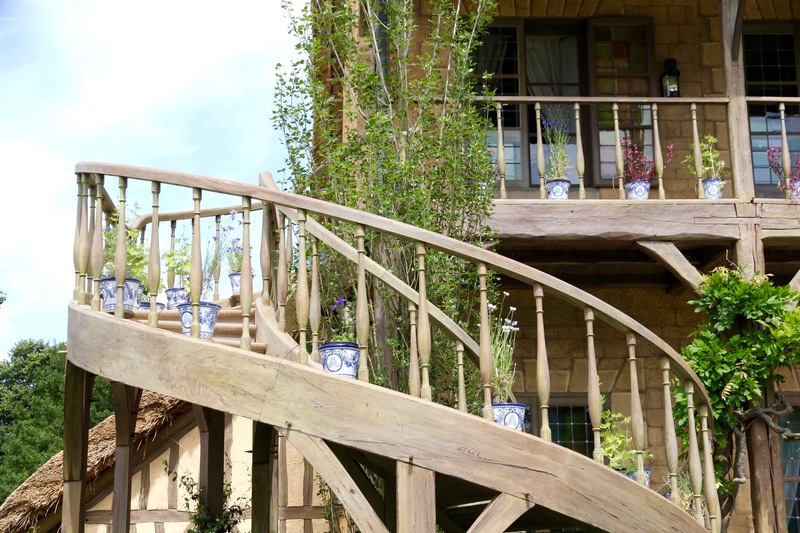 I loved this spiral staircase, with its blue willow flower pots. 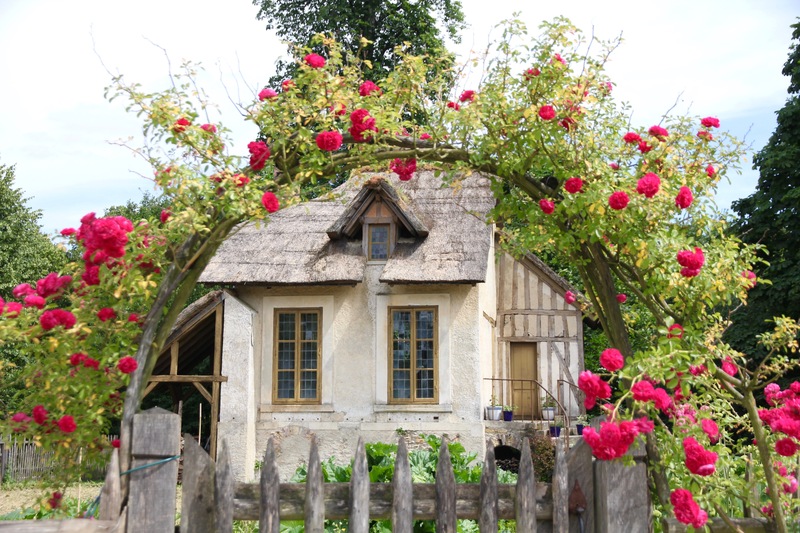 There were 12 thatch-roofed buildings in the Hamlet. Marie’s was the only one not thatched. 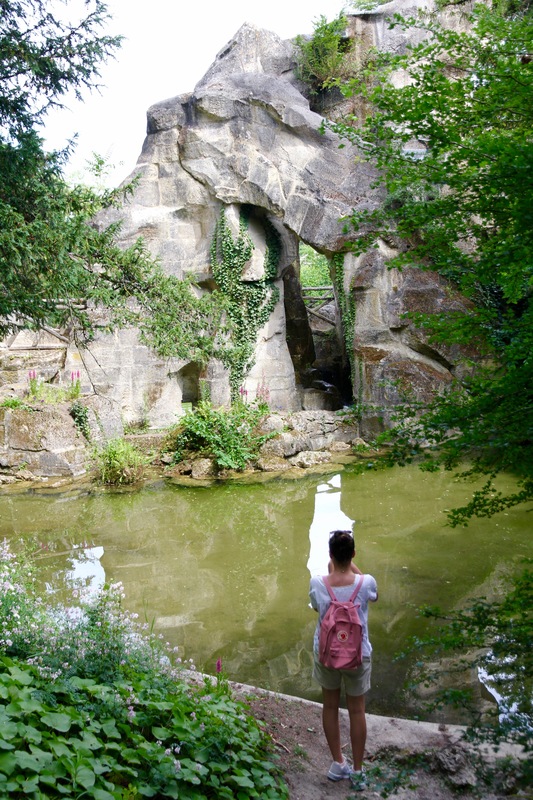 Just past the Hamlet is The Grotto, a quiet place we would have loved to visit for reading and journaling. 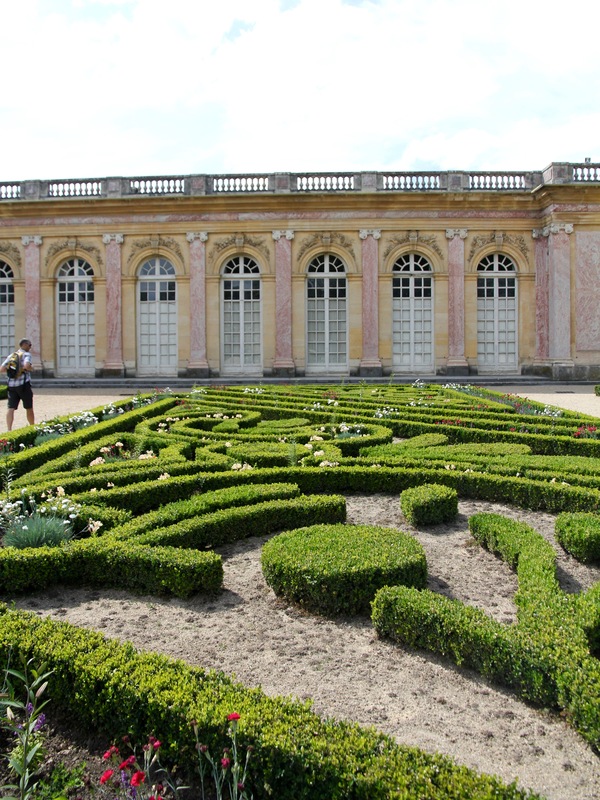 From the Hamlet, we made our way to the Trianon Palaces. 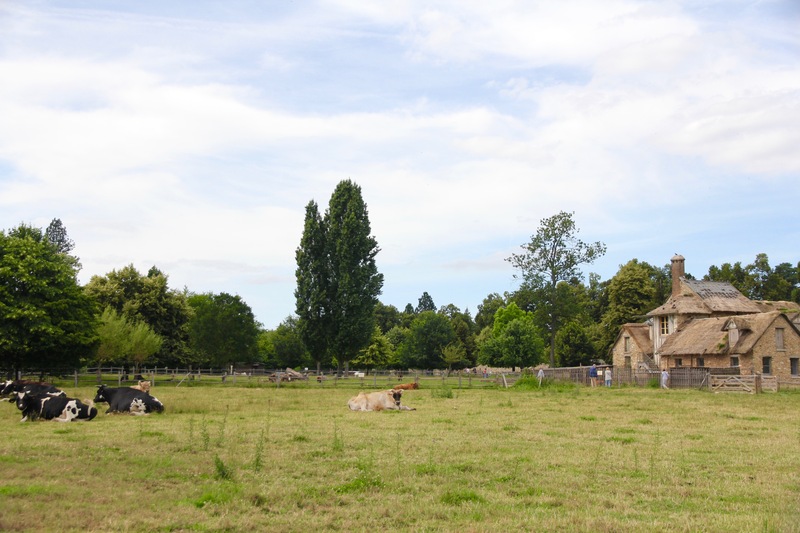 Starting with Le Petit Trianon. 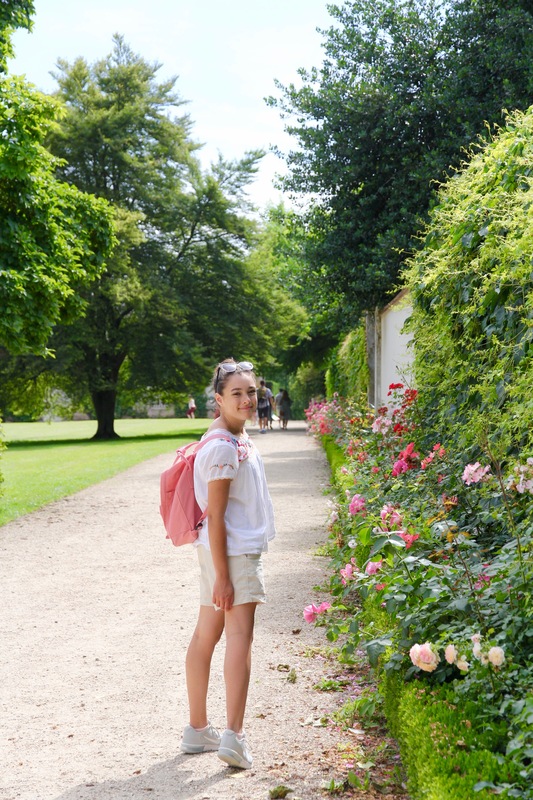 Eliza loved the roses and flower gardens. 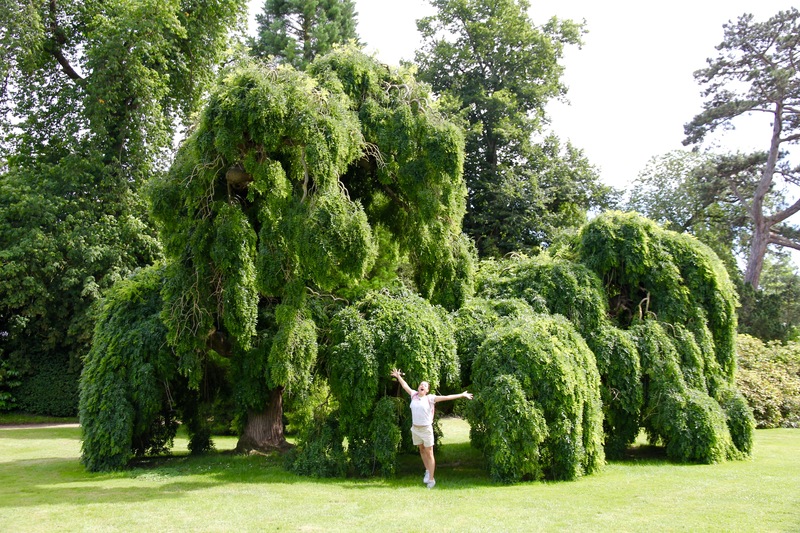 Before touring the Petit Trianon, we found this amazing open grassy area with a tree that looked like Snuffleupagus. Remember him from Sesame Street? His hair all flowy and wispy, draped and swinging as he plodded along. Eliza and I explored inside. 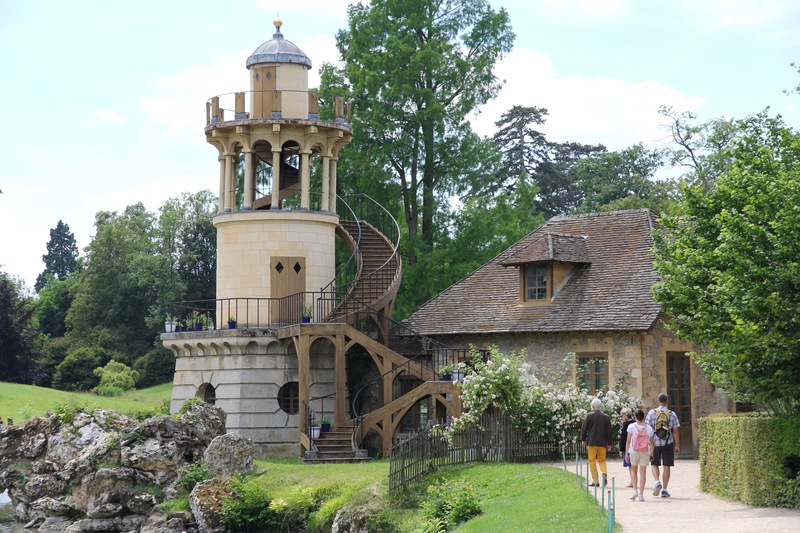 It was a kids’ treehouse DREAM! All kinds of places to climb and build hide-outs. I have some footage we’ll include in our France video later. 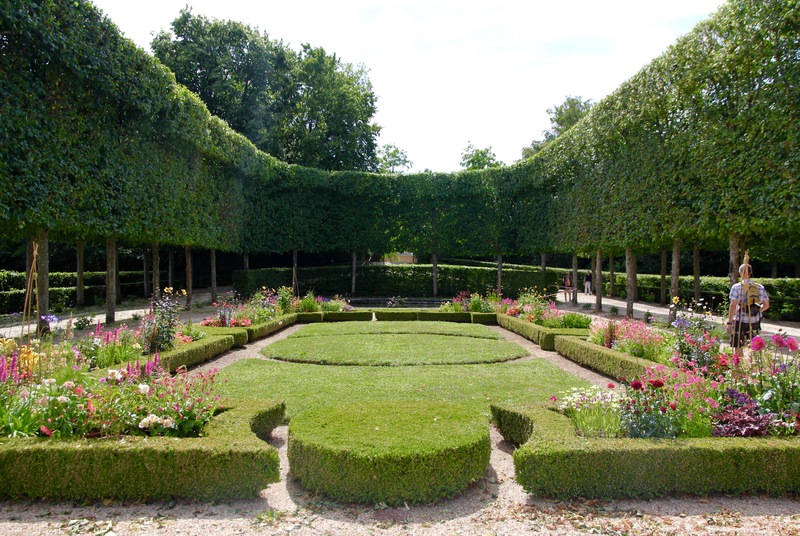 Many of the trees were pruned into the most amazing shapes, seamlessly lined up together, leaves entwined. 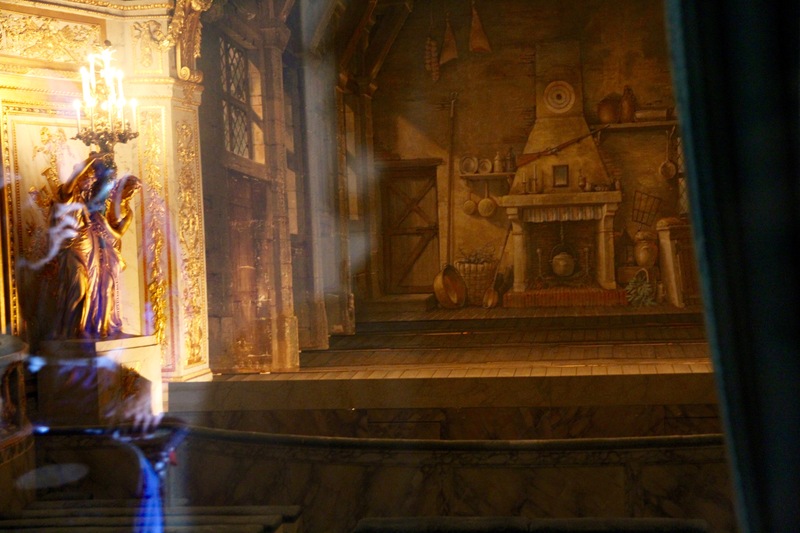 I was fascinated to learn that Marie was a talented actress and had her own theater, complete with all the scenery, curtains and props a full-sized stage would have had back in that day. Notice the semi-circular pruning of trees to the right of this image above. 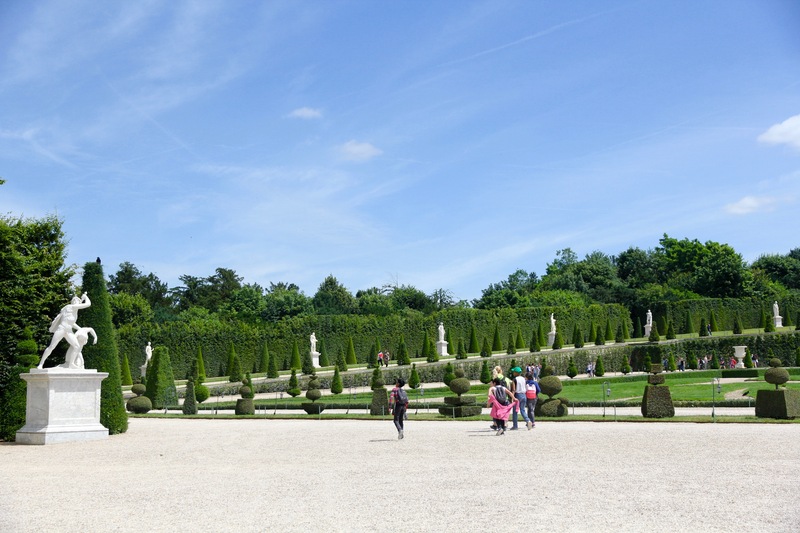 Enter the gardens of the Grand Trianon. I made Eliza do a little curtsy. Not quite her style. Check out that forced smile. Ha! 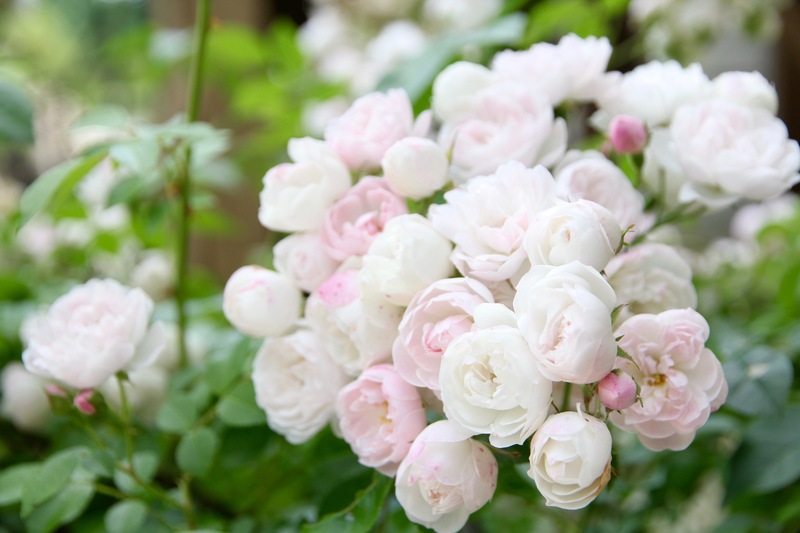 Notice the delicate pink exterior. 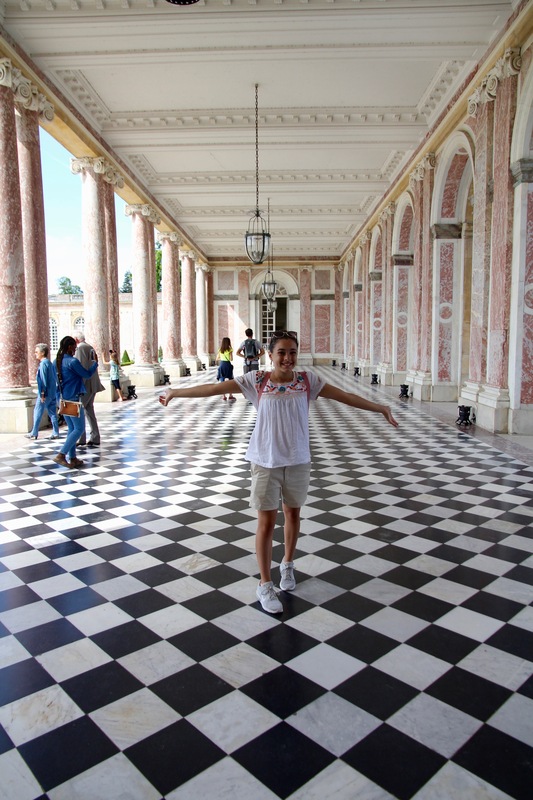 Originally the building was covered with blue and white ceramic tiles, but when they started to crumble, soon after it was built, the palace was renovated with pink marble. 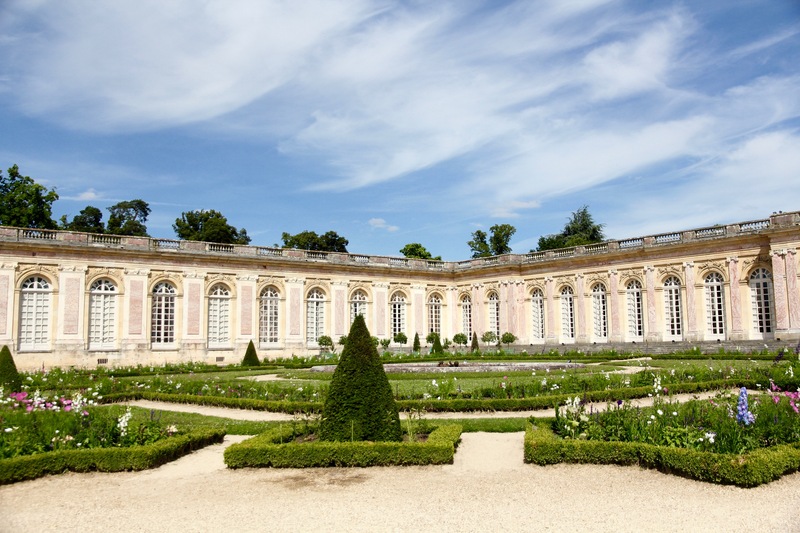 The Grand Trianon was Louis XIV summer getaway. His getaway from his getaway (the Château) I guess. He spent a couple nights a week here, more in the summer, to escape the politics and strict etiquette of court life. Poor Louis. Do you feel sorry for him yet? This is the King’s bedroom. The fence separated him from commoners who would come into the bedroom to see him wake. This whole principle of commoners coming to observe court life seemed so odd to me at first, but then I tried to think what we have in comparison, and I think reality TV boasts a disturbing resemblance. We aren’t physically in their kitchens or bedrooms, but we might as well be, as families and individuals parade their dysfunction and drama on screens of all sizes, for all the world to see. 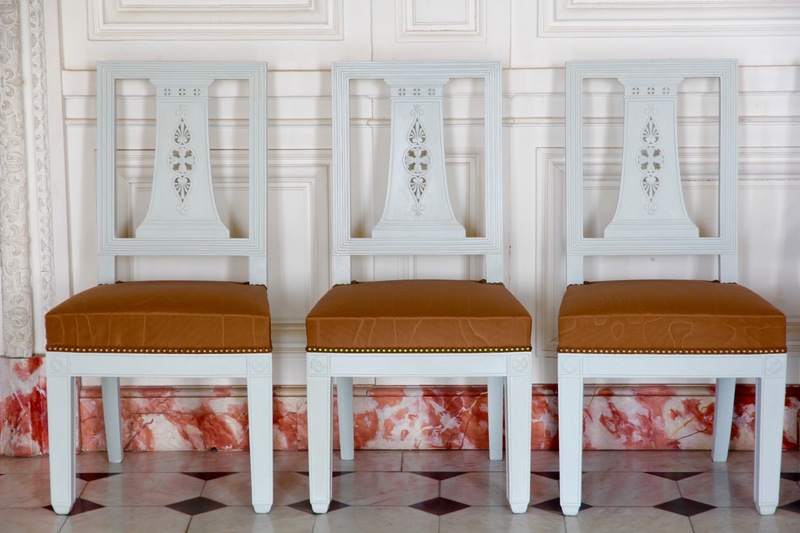 Eliza and I called these the caramel chairs. Don’t they look deliciously like soft, chewy caramels? A few details, up close. And here is the Queen’s bedroom. Slightly smaller but very reminiscent of the Princess and the Pea story, don’t you think? This portico was amazing. With it’s pink marble columns and vintage 50s tile. Ok. Maybe not vintage for Louis. 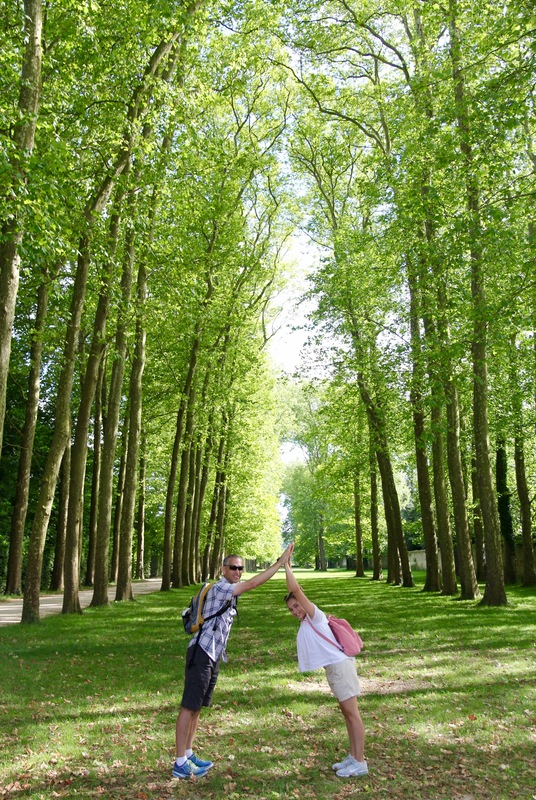 And that was the end of our 15 mile walk around Versailles. Our phones told us at the end of the day, we had walked 15 miles. 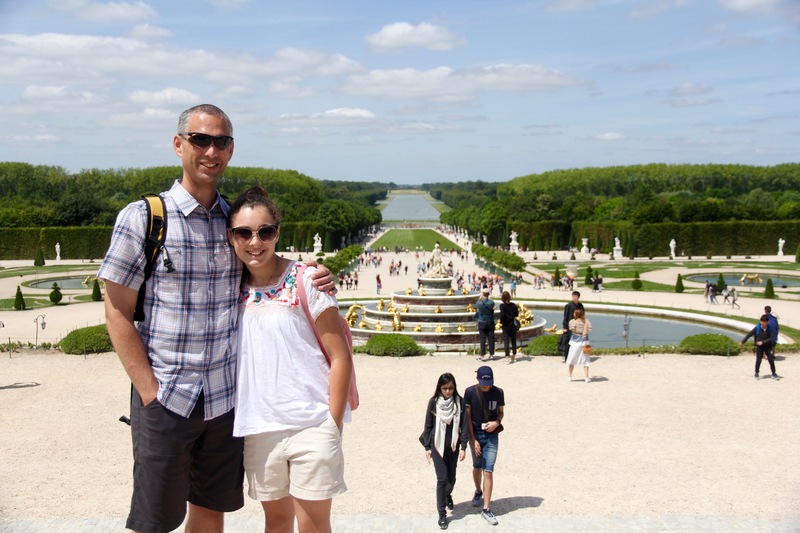 But I better factor in the mile plus we walked from Versailles to the LDS Temple in the town of Versailles. Look at these gorgeous grounds. 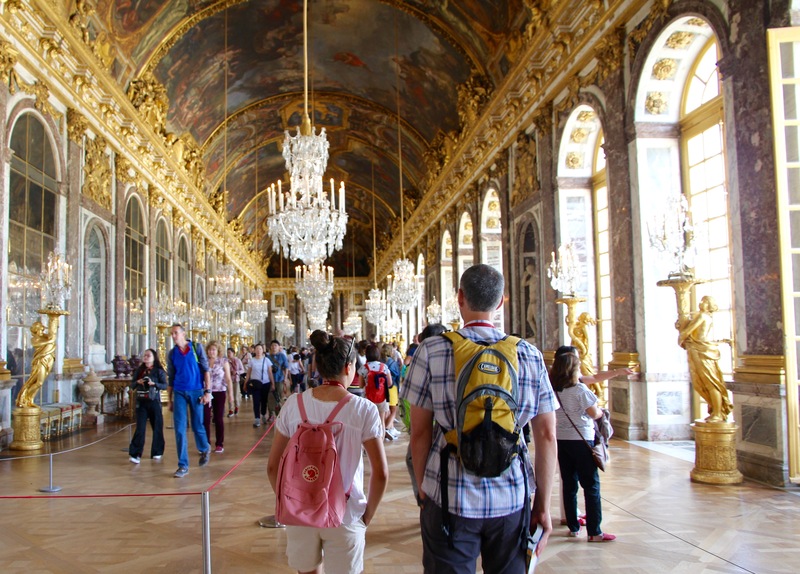 It was quite a contrast coming from busy, elitist, spendthrift Versailles. 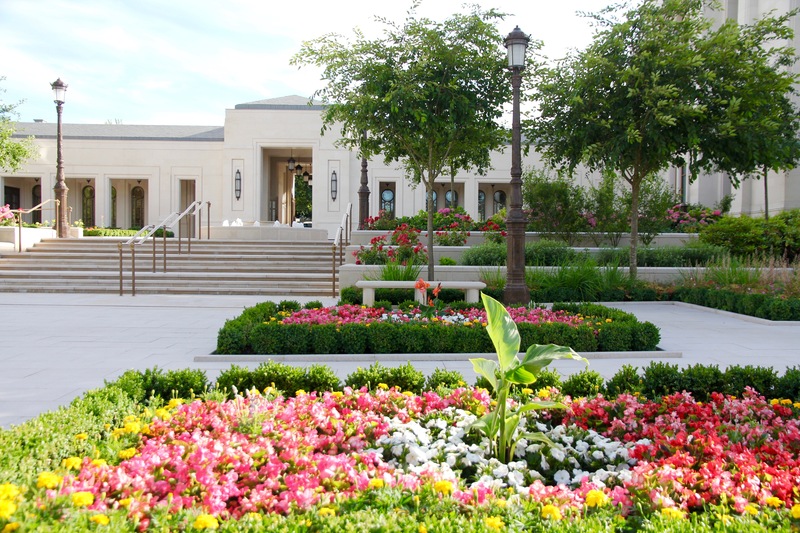 This peaceful, dedicated place, with a beautiful courtyard, is open to everyone. Here the inscription on the temple read, La Maison Du Seigneur. HOUSE of the LORD. Not the house of Apollo, or King Louis. Or Marie. There were no images of men or women enshrined in gold for us to worship. Just a spirit that witnessed to our hearts that this was indeed God’s house. Temples are meant to be separate from the world, a haven from the pressures and noise of people, things, or even ideas around us. We go to temples to focus on our relationship with God and discover what He needs of us. Once I am inside, I always feel God’s Spirit. I find comfort and direction. We go because we want to follow and learn from Jesus. Everything inside temples point us to a divine Savior. To our dependence upon something greater than ourselves. To the need for redemption and forgiveness, for bounds and eternal blessings. And for sacrifice – the willingness to give up whatever it might take to do what God asks of us. 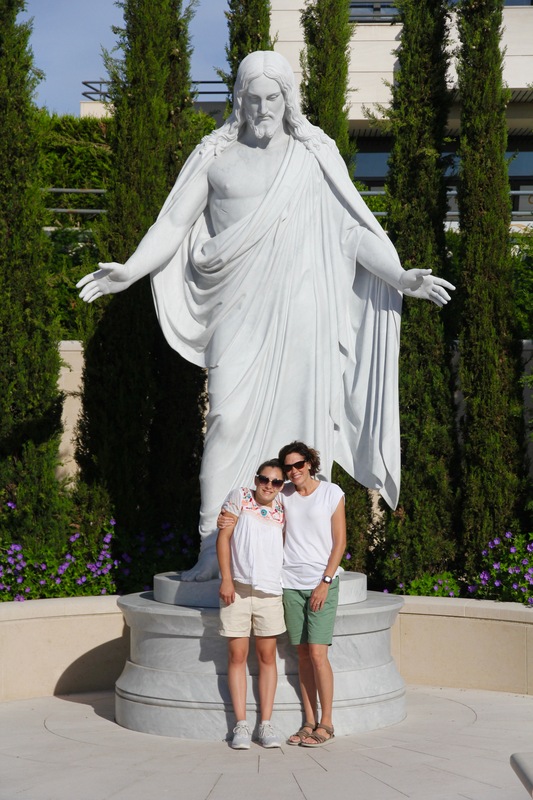 We loved this full-size Christus statue of the One True King. Our Savior, our Redeemer. Our King of all Kings. We met this darling man, Elder Wood from Arizona. 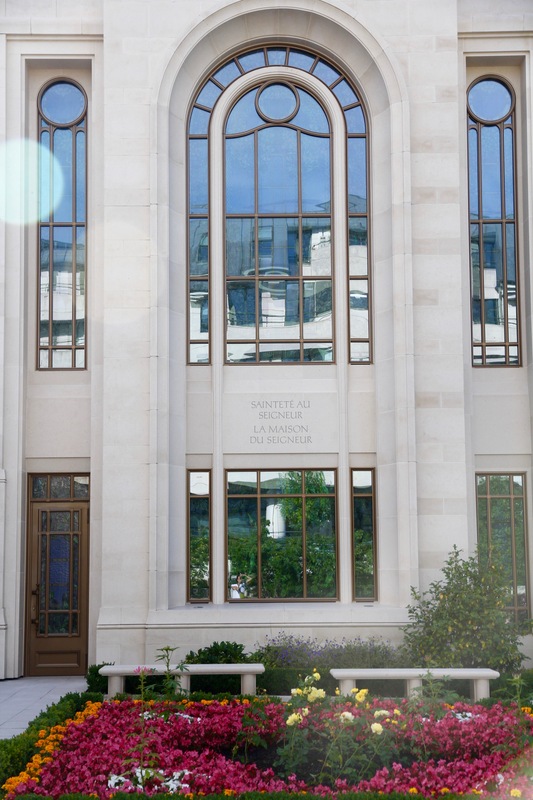 He is the director of the Paris LDS Temple Visitors’ Center. 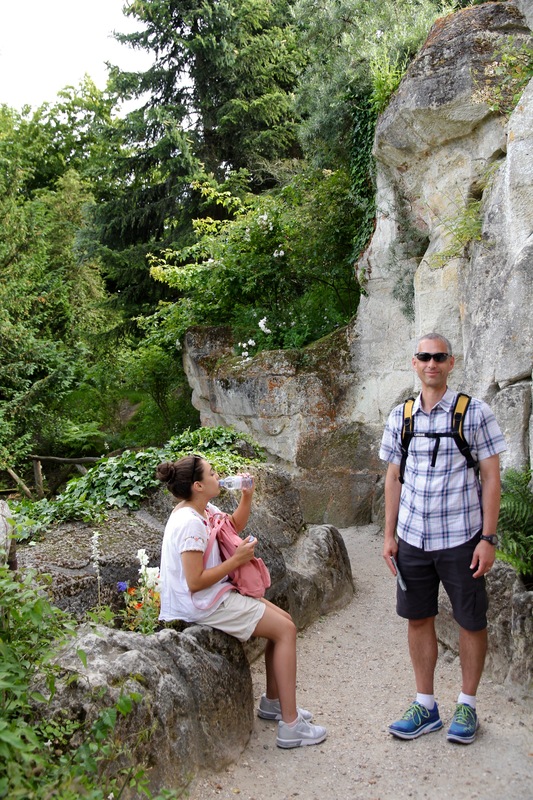 He spoke fluent French and showed us around. 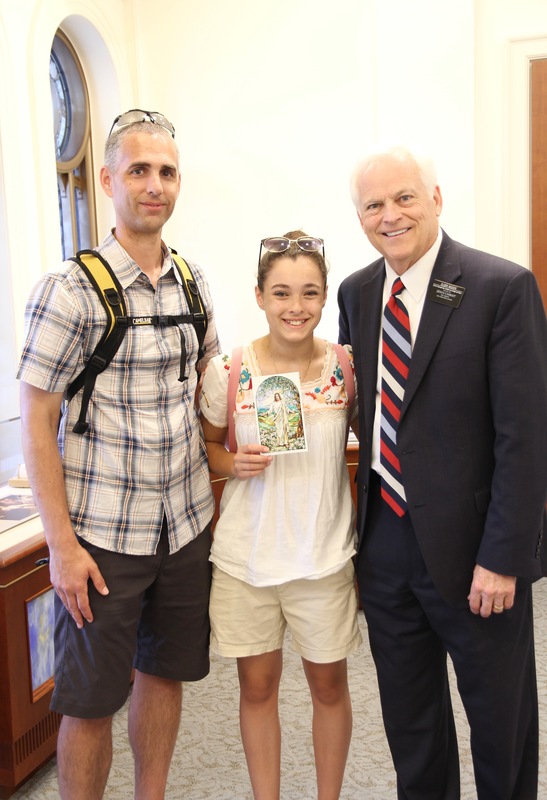 He thoughtfully catered his tour to Eliza, talking about the importance of women in God’s plan, their valued place in the world, and in the temple. 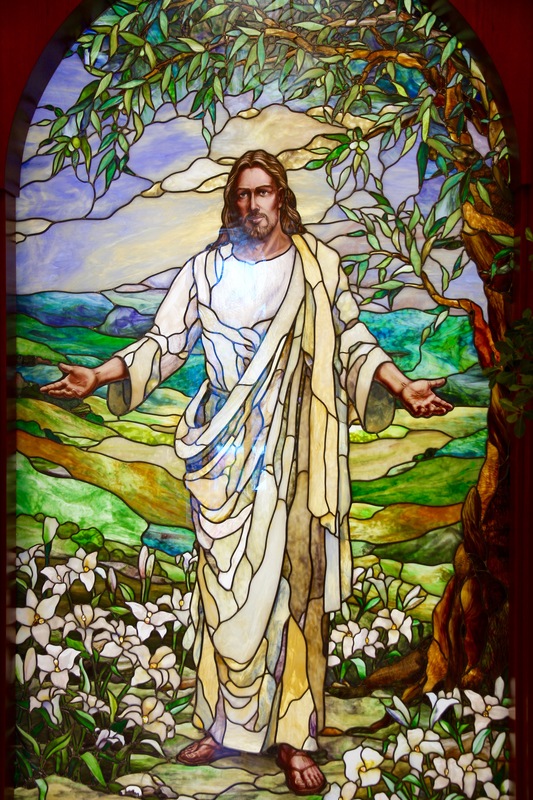 He talked about the power that comes from making and keeping covenants with God and gave Eliza a print of this beautiful stained glass Christ that greets you as you enter the Visitors’ Center. Eliza loved this stained glass and Doug and I were touched that Elder Wood would take such an interest in her, to express his confidence in her and try to teach and encourage her on her own path of discipleship. 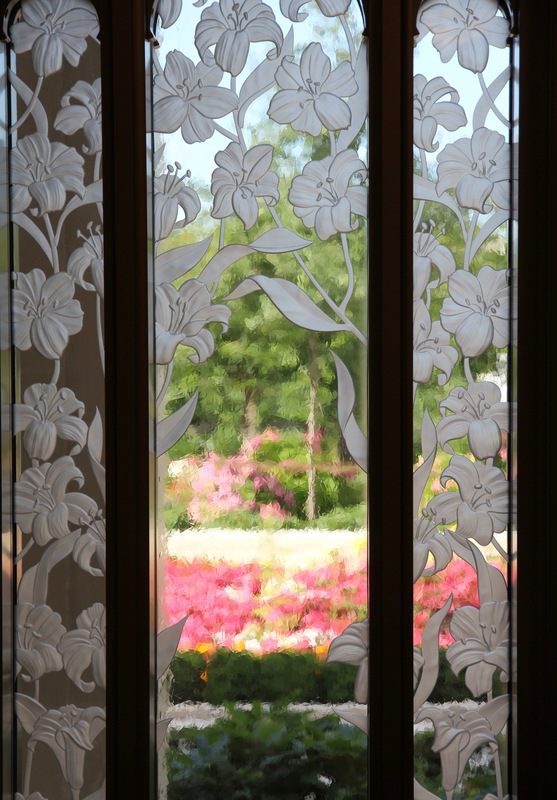 He explained to us that all the windows in the temple and the visitors’ center were created to look like impressionist art, when viewed from the inside looking out. Isn’t that amazing? 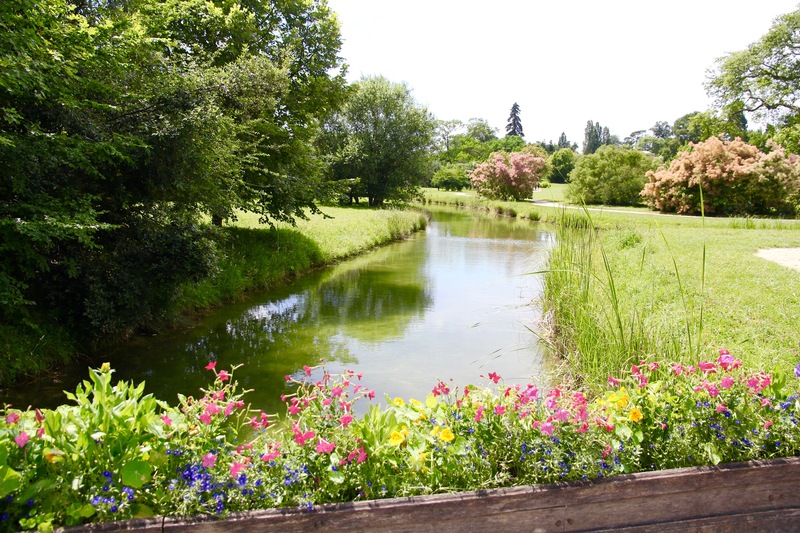 How much the gardens assume the look of a Monet or Renoir? 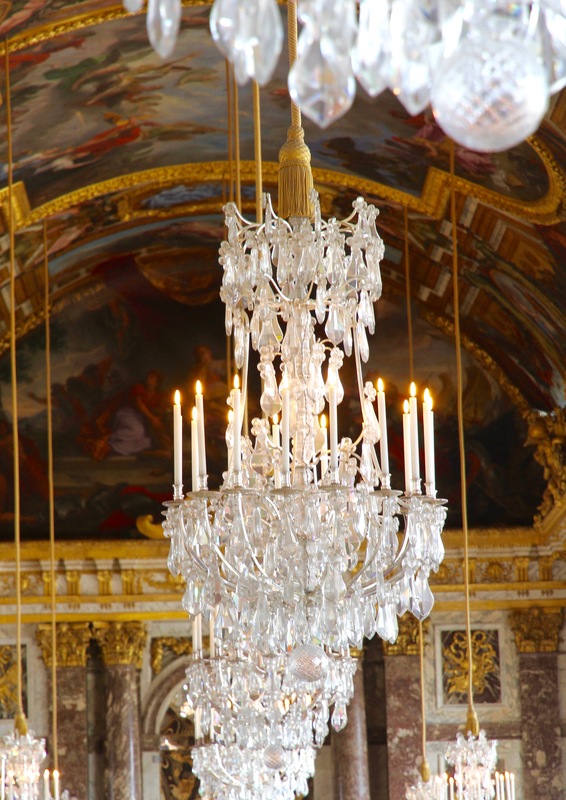 So Versailles, you came full circle for us. From Kings of this world. To a King with a Kingdom greater than this world. 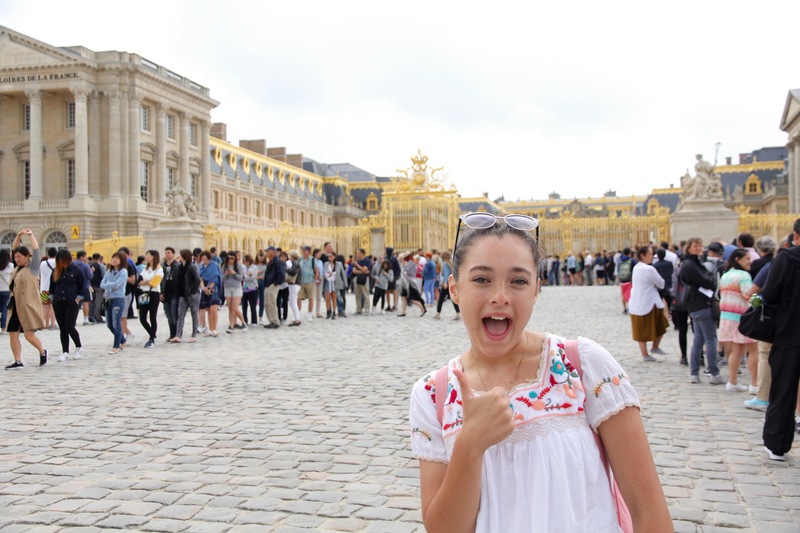 Versailles was full of teaching, incredible history, overindulgence that made our heads spin, lifetimes lived, replete with too much while so many struggled with too little. Then we came to a place where it didn’t matter what you had or didn’t have. A place where the sign read, Everyone Welcome. Because all are alike unto God. All children on the earth are His. All are welcome in the Lord’s House. And I was reminded that the Lord isn’t concerned with possessions or titles. He looks only on the heart. This is so important for me to remember as I try to navigate a world where the pressure to have or to be or to look a certain way, doesn’t abate, won’t abate, even in my mid-forties. And it’s not just there for me; it grasps at my children. How do we navigate it? We constantly reassure ourselves with God’s unconditional love. We treasure up His words by reading them often. And we teach our children who they are. That they are God’s son or daughter. That confidence comes from a relationship first with Him – a connection they can forge stronger than any other. And that they must look up to find their worth, not at a screen, or within a certain circle of friends. Then, after they look up and find that rooted place, we teach them to reach out and bring others in. What an amazing trip for the three of you!! What incredible memories you’ve made! 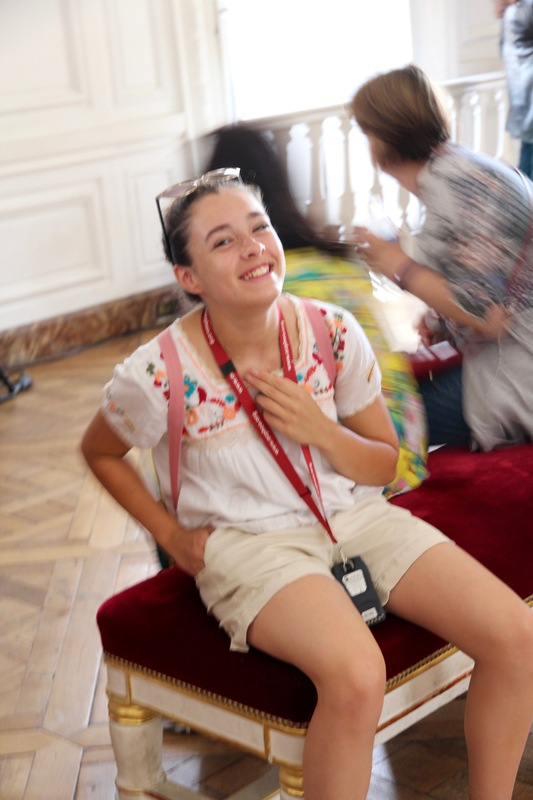 I absolutely loved the pictures of Eliza hearing the news about the trip to France. Her smile and laugh are magical! I love how you immersed yourself in the history while you were there and made so many connections. I loved getting a glimpse of all the beautiful places you visited. The architecture in Paris is simply stunning. It’s just perfect how you connected this post with King Louis to the King of Kings. Your insights always uplift me.